I vividly remember gazing the stars from my patio when I was a kid. Enamored by constellations, I would move my finger in the sky as if to connect the dots that would form The Great Bear, Orion and the likes. Looking back at the times that they were, I’m convinced that if I were to be bound by co-ordinates of space and time, I would love to be but a speck in my event horizon. Remember reading about Laika, the Russian dog who was sacrificed to space for scientific pursuits? 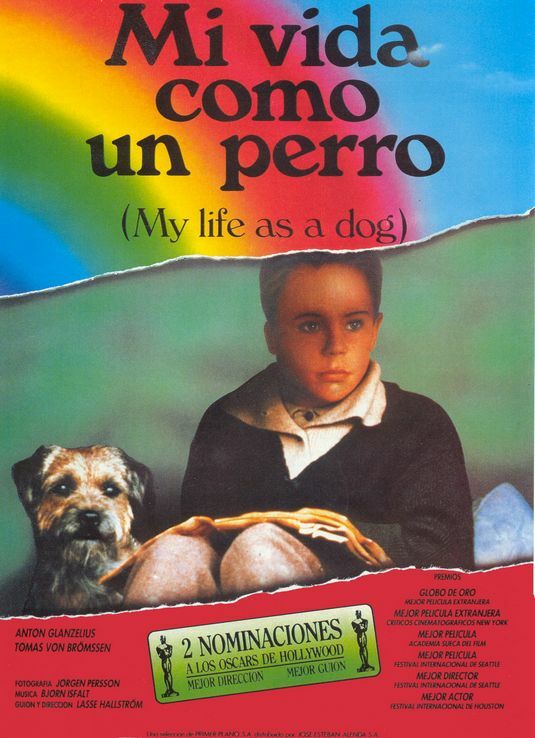 The motion picture ‘My Life as a Dog’ (Mitt Liv Som Hund) is based on the autobiographical novel by Reidar Jonsson. The plot revolves around a pixilated 12 year old boy, Ingemar, who is sent to live with his relatives as his mother is terminally ill. Lasse Hallstrom(who later directed Hachiko) brought this incredible coming of age movie to the screen. Ingemar survives all that life throws at him by comparing his condition to Laika, the Russian space dog who was rocketed to his death and had nothing to say in the matter. He has sleepless nights pondering over the canine’s eventual dismal fate thus showing a kind considerate side to him beneath all the pranks. As the movie progresses, Ingemar begins to identify with Laika more and more as his mother’s health deteriorates. The movie deals with love, abandonment and growing up in its svelte screenplay. Here’s a brief history of animals in space from NASA’s archives. More on dogs in space. Below is one of the many stamps released in commemoration of Laika’s contribution to space exploration. Wonder where would we be if not for the supreme sacrifice of our animal brethren. Thank you, Abhi. This is a certain must watch and I hope to catch up soon. I have been having a similar stamp in my collection for quite some time. Now I know something behind it. Nice post. I haven’t seen the movie yet but will soon watch it. I’ve seen Hachiko many times and I’ve cried each time I saw it. Animals – and dogs most of all (in my experience) have such an amazing capacity to love their human, despite everything. They put all their faith and trust and love in that one person for an entire lifetime! This movie is definitely a must watch!!! Do watch the original Hachiko(Japanese) movie too:) You’ll love it! Next Next post: Happy Birthday dog!